Bourne Skating Club - Whether you aspire to be a figure skater or a hockey player, you need to start with the basics! you need to start with the basics! Skating is one of the world’s greatest sports! Skating in Basic Skills is fun, challenging and rewarding, regardless of age. Skating is a sport that can last a lifetime! Whether your goal is to aim for the Olympics, learn to skate backward, improve your overall health and fitness, impress your friends, or just to have fun on the ice, you can find it with the Basic Skills Program. The Bourne Skating Club uses the United States Figure Skating's Basic Skills Program for Learn-to-Skate classes. The USFS Basic Skills Program has been developed as a beginning ice skating program that is challenging, rewarding, but most of all FUN! Participation in the program will enable skaters of ALL ages and levels to learn the fundamentals of ice skating. It also provides the athlete with the opportunity to be a competitive or recreational figure skater or hockey player. It is a nationally recognized program. 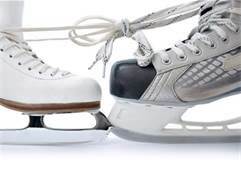 Our program encourages ice skating at all levels and is designed to keep students excited about skating from the time they begin until they achieve their goals. Our instructors are all USFS certified instructors. Each skater will receive an embroidered badge for each class level completed at the end of each session. Learn to Skate classes are highly recommended for the beginning skater to learn the basic fundamentals of ice skating. As a skater advances through the USFSA Basic Skills Program and the skating maneuvers become more difficult, private lessons may be used to supplement the group lessons. Skaters who have either passed the levels in the USFS Basic Skills/Learn to Skate Program, have a desire to compete or just want to pursue a higher level of skating can join the Bourne Skating Club.